We all have favorites. There are favorites foods, activities, people and so on. Our favorites choices may not be the best, but are convenient or easy. 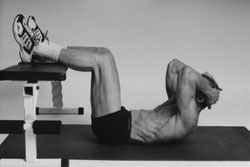 When it comes to ab exercise selection let your favorites be the best, most effective ab exercises. 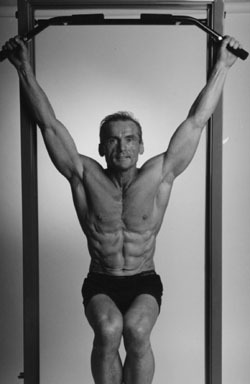 It is no secret that hanging leg raises and their variations are my favorites. #1 Reason: They focus on lower abs. Most everyone will agree that their lower abs need the most work. Here is a test for you to perform. With one hand pinch some fat at the very top of your abs, then with other hand pinch some fat at around the belly bottom level. Hold both pinches while looking into a mirror. The lower ab pinch will hold significantly more fat than the upper ab pinch. This means that the lower abs need more muscle to be seen through the increased fat layer. #2 Reason: They are tough to do! Here is why! Your legs are heavy and long, so they lever a great weight on your abs. Next, leg raises have the longest range of motion of any ab movement. Therefore: long range of motion x heavy weight=maximum work performed per repetition. #3 Reason: Hanging leg raises are the only moves that allow you to view your abs, as they are working, by placing a mirror in front of you. Every gym has numerous mirrors so that you can view your form as you do bicep curls, standing presses, laterals, etc. Few if any use the mirror to check their form and intensify an ab workout. First find a chin up bar that you can hang from. Next place a mirror in front of you so you can see your abs as you work. This is the single most important thing you can do to target your abs. With knees slightly bent, raise your legs to about parallel. At the top of the movement squeeze your abs so that you can see the most detail in your abs. Adding a twist of your hips both to the right and left furthers visible ab separation. After a double twist at the top or an extended squeeze slowly lower your legs. The numbers of reps, sets, amount of leg bend, hip twists, etc. 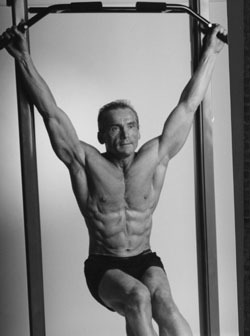 are totally dependent on seeing the most ab detail while doing the exercise. You will notice less visible ab detail as you start to fatigue your abs. As this happens drop to an easier movement or less reps. Pick 3 of the above moves and superset them for 2 or 3 giant sets. Stop your reps or drop to a less difficult exercise when you cannot see your abs as clearly as when you started your ab workout. Focus all your mental power on flexing hard your abs with every rep. A giant set consists of 2 or more exercise performed in a non-stop fashion. Perform 2 or 3 giant sets two or three times a week. Some other favorites: since you cannot use a mirror to check your form on these ab exercises, let me highlight what you need to focus on. Lay down on a comfortable flat surface with your hands slightly under the buttocks. This will tilt your pelvis up and the small of your back down. With knees slightly bent use your abs to raise your feet about six inches off the floor. Hold for a count of one then slowly lower your feet. 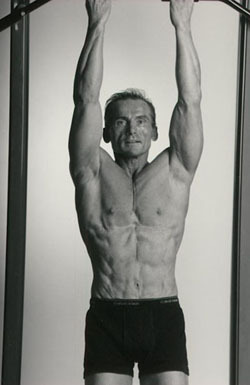 You should feel the contraction in your abs with as the small of your back pushes down on the floor. With your legs elevated in this fashion, your pelvis will be tilted forward and the small your back will be in contact with the floor. Place your hands lightly on the side of your head. Now lift your shoulder blades off the floor by contracting your abs. As you are moving up do not tuck your chin in but rather look at the ceiling getting as high as possible. Hold at the top for a count of one then slowly lower yourself to the starting position. Do 2 sets of 6" leg raises followed by 2 sets of lying crunches. When done correctly you will feel it after the 4 sets. Two or three times a week should do it for your abs. Add 1 set of each if you can do 12 or more slow reps of the 6" leg raises and lying crunch. After that you can move up to 1 to 3 cycles of the 3 hanging ab exercise giant sets. Please do not fool yourself with sloppy, poor form reps that have a quick momentum but do not give you Delayed Onset Muscle soreness (DOMS). You should feel it in your abs, 1 to 2 days later if you did anything for them.